Not too many posts in recent times and its been a while since I looked at the yield curve and I have to admit that after scanning the various newspapers I was expecting to see some significant moves. As the above chart shows, the curve has barely moved in the past few weeks and most of the move has occurred at the longer maturities…which is often a sign that the longer term outlook for the economy is looking good. I’m not sure that’s the case, particularly when you see the sharemarket correct in recent weeks but either way, the yield curve movement is hardly a sign of the bond market crashing and its really the same old story….yields are low because the outlook for both inflation and the economy is both low and weak, respectively. I’m sure one of the most frustrating aspects of financial markets is their “risk on” or “risk off” behaviour and the last couple of weeks or so has certainly returned to “risk off”. I’m guessing that after the 20% plus returns of the Australian sharemarket since mid-2012, the retail investor has started to dip the toe only to be hit with a sell-off that has seen the ASX200 index drop almost 6% which isn’t too kind. Anyway, the term deposit rates are certainly low in nominal terms, relative to the government bonds they are still paying a healthy margin of potentially 200bps or more, and given the US and Japan are still keen to print money you would think risky assets will continue to receive a boost..but the recent mini-correction has shown that it shouldn’t be taken for granted….but I do tend to think the liquidity flow will continue to help sharemarkets until the tap is turned off. Anyway, there is one instrument that I have not mentioned for quite some time and depending on your age at investment, it is easily the best risk-adjusted return you can get today…and it is the inflation linked lifetime annuity. 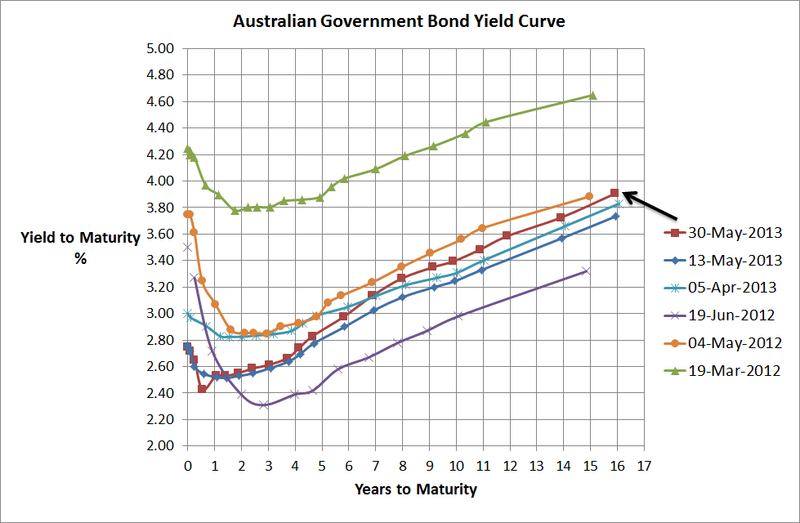 which are not the only risks…however…when you consider that a 16 year Australian government bond only yields around 3.9%pa (see above chart), the fact that a female aged 65 can receive a 5% return that increases with inflation every year and still have access to 100% of capital at 15 years into the investment, it doesn’t get much better than that in this low interest rate environment. Lifetime annuities have been forgotten for many years, due to awful liquidity and rates that weren’t terribly attractive no matter what you compared them to…so fair enough…but in recent times this has certainly changed and this product should now be a serious contender for part of a retirement income portfolio… obviously an appropriate analysis of needs and risks must be performed first before any investment to such an instrument!…my very important warning!!!! Lifetime annuities today have the potential for a premium return over bonds with an inbuilt inflation hedge…which is supposed to be why we use equities in a portfolio but with annuities you don’t get the volatility that equities provides so it should be attractive for many financial planners and certain clients.